Rumbling thunder. Gusting wind. It's that time of year again when severe weather becomes a threat. 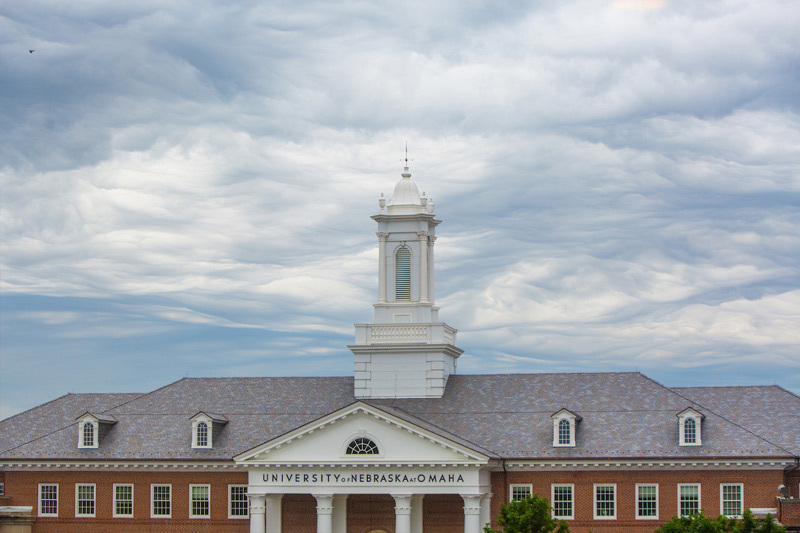 The University of Nebraska at Omaha (UNO) will conduct a routine test of campus warning systems on Wednesday, March 27, sometime between 10 and 11 a.m. in coordination with a test of Douglas County's outdoor sirens. The Department of Public Safety encourages all faculty, staff and students to participate in this mandatory drill. The UNO community can participate in the drill by either proceeding to the designated shelter area within their building and wait for an all clear signal or, if you are an instructor or unit leader, use the time to inform your class or office unit where their designated shelter area is located and what steps they would need to take in the event of an actual severe weather situation. View a list of shelter areas. View important severe weather tips. The drill, which should last roughly five minutes, will begin with a test message sent by Public Safety and an overhead page. NOTE: Even if Douglas County needs to reschedule its test for a later date, UNO will continue the campus drill as scheduled. Everyone participating in the drill should take their purses, laptops or other personal items with them to their designated shelter area. Once the drill is over, Public Safety will send an all clear message via text and overhead paging. During an actual warning scenario, students, faculty and staff must report to their designated shelter area or leave the building. Failure to follow these instructions could result in administrative, academic or possible criminal sanctions depending on the cirsumstances. You cannot be forced to stay in a shelter area; however, if you choose not to go to a shelter, you must leave the building. The Wednesday, March 27, drill will initiate regular severe weather communications testing of student housing throughout the severe weather season. UNO will test these systems at the same time the Douglas County Emergency Management Agency tests their outdoor sirens. These tests are scheduled for the first Wednesday of every month from Wednesday, April 3, through Wednesday, Oct. 2. UNO will begin its monthy testing of student housing beginning Wednesday, May 1. If you do not receive an alert during the test, but thought you were signed up for UNO Alert; or if you did not hear an overhead page in your building, please contact Sgt. Dave Points at 402.554.3700 or dpoints@unomaha.edu.